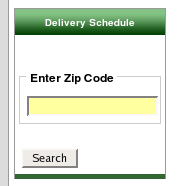 Local Message is a Zen Cart™ sidebox that allows you to provide zip code specific messages for your customers. Location: Zen Cart Plugins, under Sideboxes. Local Message allows you to create a sidebox in which people can look up their zip codes and see specific messages (typically terms and/or conditions) appropriate for their area. After a search is done, a result page is displayed with either the resulting entry from the database (e.g. 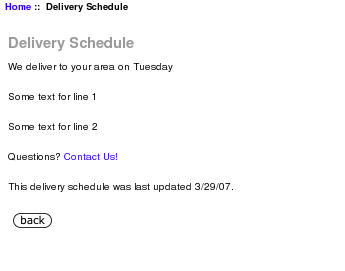 "We deliver to your area Tuesday") or an error message (e.g. "Zipcode not found"). 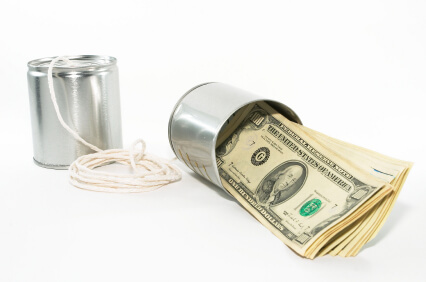 In phpMyAdmin, run the script local_msg.sql. You can also do this in your Zen Cart admin panel under Tools->Install SQL patches. If you are using phpMyAdmin and have used a prefix in your database, modify local_msg.sql to reflect this (e.g. change "local_msg" to "zen_local_msg" if your prefix is "zen_"). Import some data into the newly created local_msg table.